The Milhaus proposal for a large, market-rate apartment complex where ShurSave stands has prompted community members to speak out about their need for affordable housing. Join us at the West Penn School of Nursing auditorium on Thursday, May 24th from 6:00PM-8:30PM for an interactive workshop to follow up on our February housing affordability forum. Guest speakers from local organizations fighting for affordable housing will give short presentations about five of the most effective tools we can use to ensure housing in Bloomfield remains affordable for all. 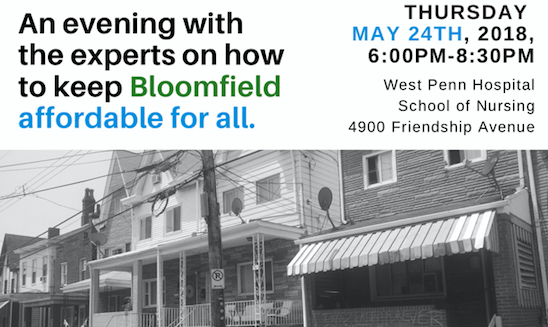 If you have any questions, contact Bloomfield Development Corp. at info@bloomfieldnow.org or call 412.681.8800.